John Paston I was an English country gentleman and landowner. He was the eldest son of the judge William Paston, Justice of the Common Pleas. After he succeeded his father in 1444, his life was marked by conflict occasioned by a power struggle in East Anglia between the dukes of Suffolk and Norfolk, and by his involvement in the affairs of his wife's kinsman, Sir John Fastolf. A number of his letters survive among the Paston Letters, a rich source of historical information for the lives of the English gentry of the period. The Paston Letters are a collection of correspondences between members of the Paston family of Norfolk gentry and others connected with them in England between the years 1422 and 1509. The collection also includes state papers and other important documents. Mautby is a civil parish in the English county of Norfolk. The parish comprises a largely rural area along the north bank of the River Bure, and includes the small villages of Mautby, Runham and Thrigby. It is located some 10 km (6.2 mi) west of the town of Great Yarmouth and 30 km (19 mi) east of the city of Norwich. Sir John Paston, was the second son of John Paston and Margaret Mautby. He succeeded his elder brother, Sir John Paston, in 1479. He fought at Barnet and Stoke with John de Vere, 13th Earl of Oxford, served as his deputy when Oxford was appointed Lord High Admiral of England, and was a member of the Earl's council. A number of his letters survive among the Paston Letters, a rich source of historical information for the lives of the English gentry of the period. Hellesdon is a village and suburb of Norwich in the District of Broadland in Norfolk, England. It lies approximately four miles (6 km) north-west of Norwich and has a population of 11,132, according to the 2011 Census. Norwich International Airport is located near the village. Sir William Yelverton was a judge in Norfolk, England and twice a member of parliament for Great Yarmouth, Norfolk. Fleet Street is a major street mostly in the City of London. It runs west to east from Temple Bar at the boundary with the City of Westminster to Ludgate Circus at the site of the London Wall and the River Fleet from which the street was named. Eltham Palace is a large house in Eltham in the Royal Borough of Greenwich, in south-east London, England. It is an unoccupied former royal residence owned by the Crown Estate, and managed since 1995 by English Heritage which restored the building in 1999 and opened it to the public. The interior of the Art Deco house has been critiqued as a "masterpiece of modern design". 1 2 3 4 5 6 7 8 9 10 11 12 13 14 15 Castor 2004a. 1 2 3 4 Castor 2004. 1 2 3 4 5 6 7 8 9 10 11 12 Tait 1895, pp. 2-5. 1 2 3 4 Davis 1971, pp. lviii-lix. ↑ Davis 1971, p. liv. 1 2 3 4 Davis 1971, p. lv. 1 2 Ross 2011, p. 63. ↑ Abstract of will of William Haute, Esquire, proved October 1462, in N.H. Nicolas, Testamenta Vetusta: being illustrations from wills, of manners, customs, &c. (Nichols & Son, London 1826), I, p. 300. The will identifies him as the father. ↑ L.S. Woodger, 'Haute, William (d.1462), of Bishopsbourne, Kent', in J.S. Roskell, L. Clark and C. Rawcliffe (eds), The History of Parliament: the House of Commons 1386-1421 (Boydell & Brewer 1993), History of Parliament online. 1 2 Adams 1986, p. 103. Thomas Howard, 3rd Duke of Norfolk, was a prominent Tudor politician. He was an uncle of two of the wives of King Henry VIII of England, namely Anne Boleyn and Catherine Howard, both of whom were beheaded, and played a major role in the machinations affecting these royal marriages. After falling from favour in 1546, he was stripped of the dukedom and imprisoned in the Tower of London, avoiding execution when King Henry VIII died on 28 January 1547. Sir John Tyrrell lord of the manor of Heron in the parish of East Horndon, Essex, was Knight of the Shire for Essex, Speaker of the House of Commons, and Treasurer of the Royal Household. Lord Edmund Howard was the third son of Thomas Howard, 2nd Duke of Norfolk, and his first wife, Elizabeth Tilney. His sister, Elizabeth, was the mother of Henry VIII's second wife, Anne Boleyn, and he was the father of the king's fifth wife, Catherine Howard. 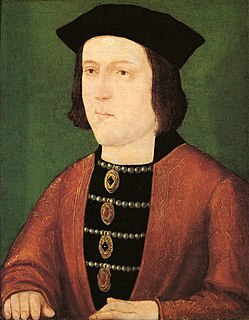 His first cousin, Margery Wentworth, was the mother of Henry's third wife, Jane Seymour. Thomas Scales, 7th Baron Scales was an English nobleman and one of the main English military commanders in the last phase of the Hundred Years' War. The son of Robert de Scales, 5th Baron Scales, he succeeded his brother Robert de Scales, 6th Baron Scales as baron. William Paston, the only son of Clement Paston and Beatrice Somerton, had a distinguished career as a lawyer and Justice of the Common Pleas. He acquired considerable property, and is considered "the real founder of the Paston family fortunes". Sir George Browne was the eldest surviving son and heir of Sir Thomas Browne, beheaded 20 July 1460. He took part in Buckingham's rebellion, and was beheaded on Tower Hill on 4 December 1483. Sir Henry Heydon was the son of John Heydon of Baconsthorpe, Norfolk, 'the well-known opponent of the Paston family'. He married Anne Boleyn, the daughter of Sir Geoffrey Boleyn, great-grandfather of Henry VIII's queen Anne Boleyn. John Heydon alias Baxter of Baconsthorpe, Norfolk, was of humble origins, the son of a yeoman, William Baxter of Heydon. He became a successful lawyer, and is known, through the Paston Letters, as one of the principal agents in East Anglia of William de la Pole, 1st Duke of Suffolk, and one of the chief opponents of the Paston family. Elizabeth Paston was a member of the English gentry who is regularly referred to in the extensive collection of Paston Letters. She was the only daughter of a Norfolk lawyer, William Paston and Agnes Barry. In her late teens and twenties she resisted marriage to several men proposed by her mother and brothers, before marrying Sir Robert Poynings in 1458, with whom she had a son Edward Poynings. Adams, Alison, ed. (1986). The Changing Face of Arthurian Romance. Cambridge: The Boydell Press. Davis, Norman, ed. (1971). The Paston Letters and Papers of the Fifteenth Century, Part I. Oxford: Clarendon Press. Retrieved 30 September 2013. Ross, James (2011). John de Vere, Thirteenth Earl of Oxford (1442-1513), 'The Foremost Man of the Kingdom'. Woodbridge, Suffolk: The Boydell Press. Tait, James (1895). "Paston, John (1442-1579)". In Lee, Sidney. Dictionary of National Biography . 44. London: Smith, Elder & Co. pp. 2–5. Richmond, Colin (1990). The Paston family in the Fifteenth Century: The First Phase. Cambridge: Cambridge University Press. Retrieved 30 September 2013. West, Diane, ed. (2004). The Paston Women. Woodbridge, Suffolk: D.S. Brewer. Retrieved 30 September 2013.